Charles Martin back with a KO win; says he wants to become undisputed heavyweight champion! 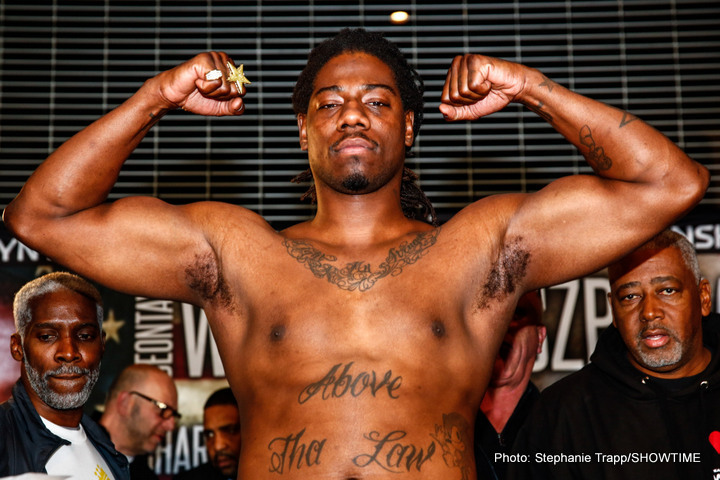 Returning to action for the first time in just over a year, and since being shot in a shocking attack last summer, former IBF heavyweight champ “Prince” Charles Martin got back to winning ways last night in Tunica, Mississippi. The tall southpaw who turned 31 this week stopped over matched journeyman Byron Polley inside two quick rounds. Martin, now 24-1-1(22) won as he pleased against the 30-21-1(13) Polley and he said after his win how he is now “back to finish what I started.” It will be a long road back, but Martin says his ultimate goal is the same as it was before he lost in just two rounds to Anthony Joshua in a hugely disappointing affair – to become the undisputed world heavyweight ruler. Martin, as is often the case when a fighter loses a big fight, says he was not in shape, mentally or physically going into the Joshua defence in London last April, but that he is now ready to reclaim his past glories and win himself some more. Again, it promises to be a long road back for Martin, but if he’s focused and if he maintains an active schedule, then who knows; Martin is certainly young enough to be able to come again. Martin has said he wants a rematch with Joshua – who he picks to beat Wladimir Klitschko this Saturday night at Wembley – but this is one rematch that seems extremely unlikely. How on earth would the promoters be able to sell a rematch in light of how easily Joshua won 12 months ago? Maybe Martin can get a crack at one of the other champions; WBO champ Joseph Parker maybe. Another interesting match-up for Martin would possibly be to face Tyson Fury in his planned July comeback. That is a match-up that would prove quite interesting.